NASA and GM's last collaboration was the recently deployed Robonaut. But the two are teaming up again to develop a robotic glove that will make working with heavy tools in space, or on an assembly line, a lot easier. The Human Grasp Assist device, or K-glove, or Robo-Glove (they really need to make up their minds) uses pressure sensors in the fingertips that automatically tighten actuators in the fingers, providing extra grip. 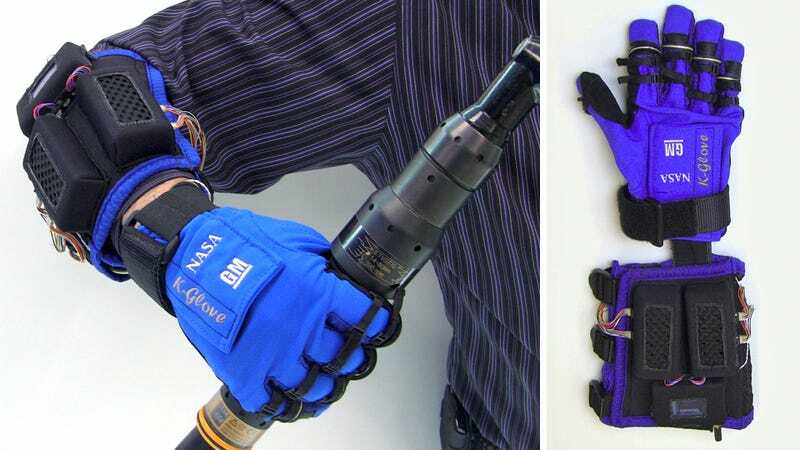 Without the glove an astronaut or assembly worker might need to exert 15 to 20 pounds of force to grip a tool, but while wearing it that would be reduced to 5 to 10 pounds. And that leads to less fatigue in the hands, allowing them to work longer.